Thursday is guest post day here at Duct Tape Marketing and today’s guest is Cassie Roberson – Enjoy! Every day thousands of people go online in search of useful information or communication through social networks. This is where your prospective customers are. So, the next question is how to get their attention and to lead them to your service offering. Saying “Don’t try to sell but try to help” at first might sound questionable, but actually this is how it works with online marketing. Online content is the first step in communication with a large number of potential customers. So, bring in some online interaction with your target audience. Don’t limit yourself with just writing a description of products you sell or services you provide. In addition to your website create an online platform where you will give professional advices and share useful information with people (a blog, Facebook page, Twitter account or altogether). In order to build a long-term relationship with a customer you need to make an impression of a reliable and trustful company. Instead of pushing to buy something from you, give them advice on how to make the right decision. Don’t be reluctant in providing information. The more you give the more you get back. Remember that if a visitor doesn’t find valuable information on your page, he would likely turn away and find it somewhere else; after all they are just a click away. In case if visitors do find helpful tips on your business page, you will instantly earn their trust as a professional. You have definitely heard about Social Media Marketing (or SMM) which is technically an online form of word-of-mouth marketing. A great thing about SMM is that business insiders are able to initiate and control company’s presence in social networks. Millions of people somewhere online are waiting for your signal to act. But before throwing a rod you need to lure the fish. 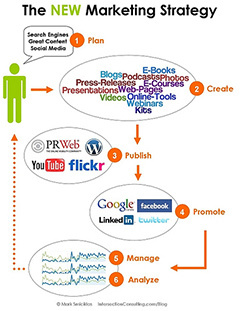 Business promotion in social networks is again all about building credibility and visibility. You have to create content that people will share and spread throughout the community. So, do not pack your Facebook page with commercial offers which are not the best posts to collect “likes”. Ideally your social posts should contain 80% of useful information or interesting facts and only 20% of promotion. Providing helpful and valuable content makes people respect your expertise. Also do not forget to make it easy to share your posts on blog and website. To get even better results maximize your content through publishing on multiple platforms. Ask your staff, colleagues and partners to help you share a new post through their personal social network accounts. “Better to see once than hear a hundred times” works best in case with online content. Instead of posting another 800 word article just share with visitors an impressive picture, short video or animated slideshow. You can also combine text and visual elements – support your article with pictures, charts or even animation. Studies have shown that combining information visual cues with text content can dramatically improve information retention; which is your ultimate goal in sharing content. To make visitors share your content it shouldn’t just be interesting but outstanding. Try to use the best tools you can find for information visualization. 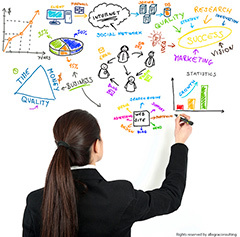 There is numerous software to create animation, infographics or slideshows online. One of the easiest and quite powerful visualization is Presenter by Easy WebContent. This free web application lets you combine pictures, text, icons, audio and video just drag-and-dropping the elements to canvas. EWC Presenter might become a great source of inspiration for creating your next blog post. All these indirect impacts could lead at the end to expansion of sales and better financial results. So, what are you waiting for? It’s time to start improving your content management right now. Cassie Roberson is a freelance writer mainly specializing in Business, Marketing and Web Design. Before writing for blogs she used to work as a financial manager for a small web design company, later got involved in numerous marketing & promotion projects (including content marketing and SMM) and even graphic design projects. With her Business degree, design and photography passion, she finally decided to become a full-time freelancer and continue sharing valuable content with online readers.